We had only just left the battleground in Vierzon, and Racing Team ADK was already back in business, getting another fabulous result in the national race from Chateauroux on 9th of June in Belgium. Both friends and opponents had been talking about how overwhelmingly strong the racing birds of Racing Team ADK had been in the interprovincial race from Vierzon on 19th of May, which saw them win a 1-2-3-4-5 provincial with the yearlings (52 out of 66), and a 2-4-5 Provincial with the old birds (22 out of 28). In addition, they had the 2-3-4-8-9-10-14-15th fastest pigeon in the race on a total of 15,722 birds. They were clearly in a league of their own. Click here to reread our report on Vierzon. After the race from Vierzon, and a few very demanding races in strong headwinds, the racing team was given a week off. This allowed them to recharge the batteries for the rest of the season, which includes several consecutive national classics of the longer middle distance and the long distance. 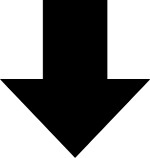 Blois Prov 2,802 YLs: 7-18-33-35-43-88-92-96-99-100… (and 47 out of 69). 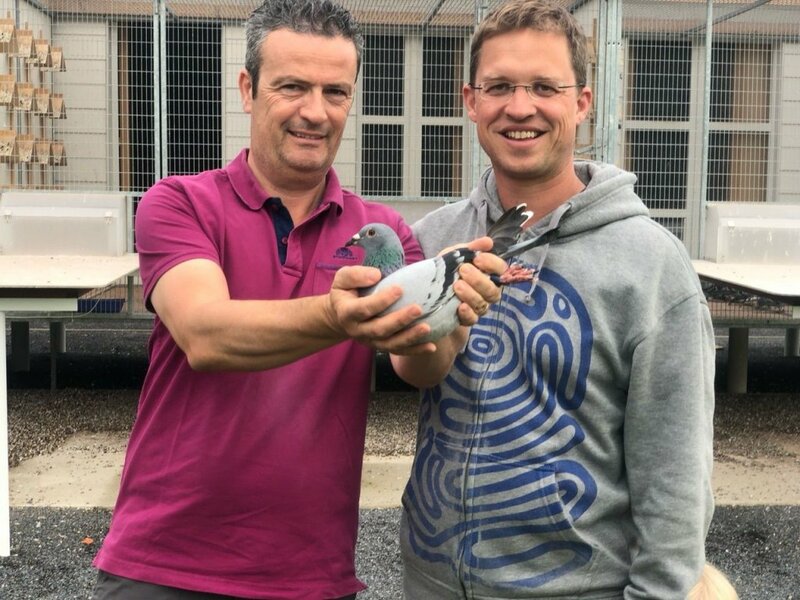 This makes Pascal Ariën the only fancier in Belgium to have 5 pigeons finish in the national top 100 in a single category. Just like in Vierzon, the pigeons of the invaluable Porsche pigeon family played a key role, as did the outstanding pair Wacko Freddy x Lieve. These are the most valuable breeding birds in the PIPA Elite Center. We take you through the different top 100 winners. This hen won a 111th Intprov. Vierzon of 5,462 YLs three weeks ago. She is a full sister of the hen that claimed a 97th national Chateauroux. Her sire is a direct Bart Geerinckx: Brother 1st Nat. Limoges BE13-6143695 (a son of Wittekop Gladiator BE05-6052111 x Daughter Chipo BE05-4323802 B.Steveninck). The dam is Daughter Nestsister Boxster BE16-4129304, and she is a granddaughter of the wonder pair Wacko Freddy x Lieve, which are the parents of Porsche 911. This underlines once again the breeding potential of this very bloodline. Click here for the pedigree of the BE17-550. 25th Nat Chateauroux   27,081 p.
69th I.Prov Chateauroux 3,061 p.
26th Nat Chateauroux 27,081 p.
99th Prov Blois       2,002 p.
Her full sister BE17-4062217 was the 6th clocked yearling from Chateauroux, finishing in 174th place national of 27,081 YLs. She is proving to be a great racing bird as well, with top results from Chevrainvilliers, Vierzon, Blois, etc. Click here for the pedigree of BE17-217. Nestsister Boxster (genotype AA DRD4 CCCT): a daughter of wonder pair Wacko Freddy x Lieve, a full sister of Porsche 911, Boxter etc. 18th Prov. Blois       2,002 p.
34th Prov. Vierzon     2,734 p.
65th Nat. Chateauroux 27,081 p.
69th  Prov Vierzon     2,734 p.
97th  Nat Chateauroux 27,081 p.
114th Intprov Vierzon  5,462 p.
Strictly speaking, we have a sixth PEC pigeon in the national top 100 as well. This pigeon, which also won a 43rd National, comes from the lofts of Karlo Van Rompaey, and she comes straight from the PEC. This outstanding racing hen originates from the noble New Freddy bloodlines as well. Her dam is Halfzus Louise BE15-4013118 (Louise won a 1st Nat. Bourges 19,735 p.), being a daughter of top breeder Dali BE13-6065127 x Daughter New Freddy-Amalia BE13-4176405. As her name suggests, she comes from two 1st Nat. 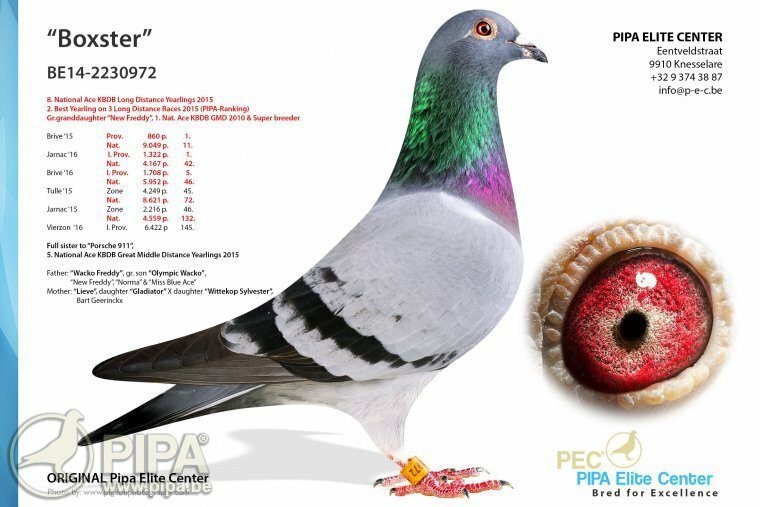 Ace Pigeons Longer Middle Distance KBDB: New Freddy x Amalia. The top results of Racing Team ADK are really starting to add up, and you can tell that the descendants of the Porsche bloodline are playing an increasingly defining role in most of these races. They have been highly successful at provincial, interprovincial, zonal and national level: they were outstanding in Vierzon, and they reaffirmed their status in Chateauroux as well. The Porsche bloodline, mainly founded on wonder pair Wacko Freddy x Lieve, is proving to be a limitless source of talented birds for the PEC. This bloodline is not only responsible for numerous great results, it is also capable of providing this team with new generations of highly talented racing birds. We reckon there is still a lot to come from this pigeon breed.